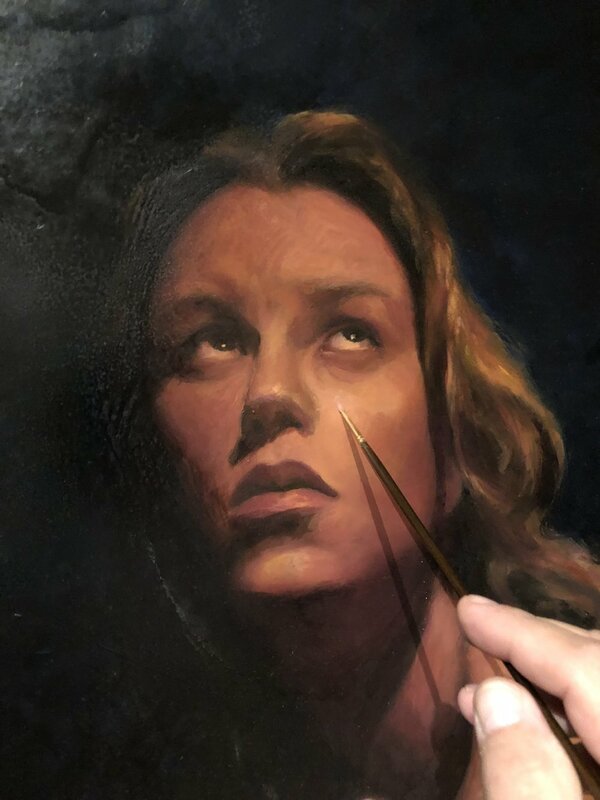 In 2018 artist Bradley J. Parrish was approached by someone who wishes to remain anonymous and asked Brad if he would be willing to do a commission painting for this gentleman and paint the holy face Jesus of Nazareth for him to donate to his church. Brad accepted the challenge and his painting in oil on linen measuring 20 inches wide by 24 inches high was completed in 2018. When Brad finished the work he gave it to his client who accepted the painting with tears in his eyes. The gentleman then donated it to his church and they too accepted with great love and appreciation for this awe-inspiring original work of art by Bradley J. Parrish. Now it is being released as a “Fine Art Signed and Numbered Giclee Canvas Edition.” Brad said, “ I want to release this piece on Easter of this year in celebrating his resurrection.” So on April 21, 2019, this special canvas edition will be available for purchase exclusively here on the artist's website. The canvas piece measures 16 inches wide by 20 inches high (which fits all colmon or standard ready made 16” x 20” opening framesize’s). The canvas edition will be signed and numbered by artist Bradley J. Parrish himself on the bottom of the piece and numbering will begin with the lowest number first. As an order comes in the next higher number will be issued. 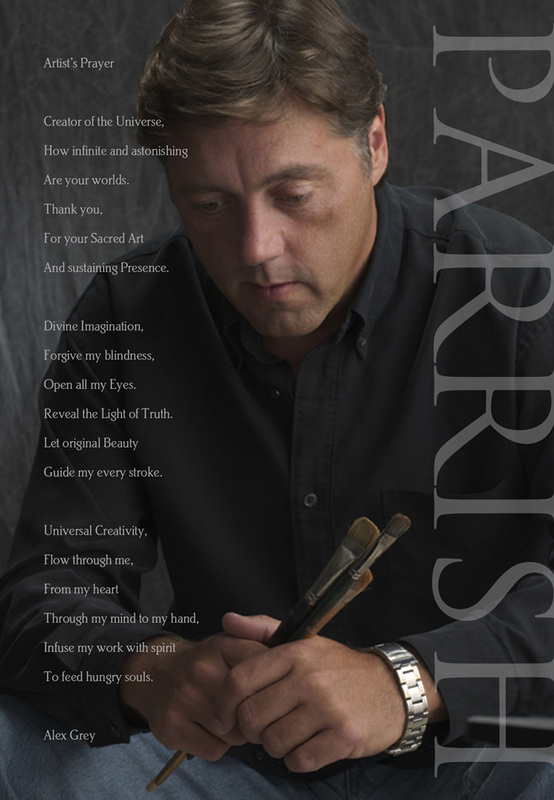 Each piece is accompanied by a Certificate of Authenticity with your canvas artwork and it too is signed & numbered by artist Bradley J. Parrish. To place your order on or after April 21, 2019 visit our online store click here. 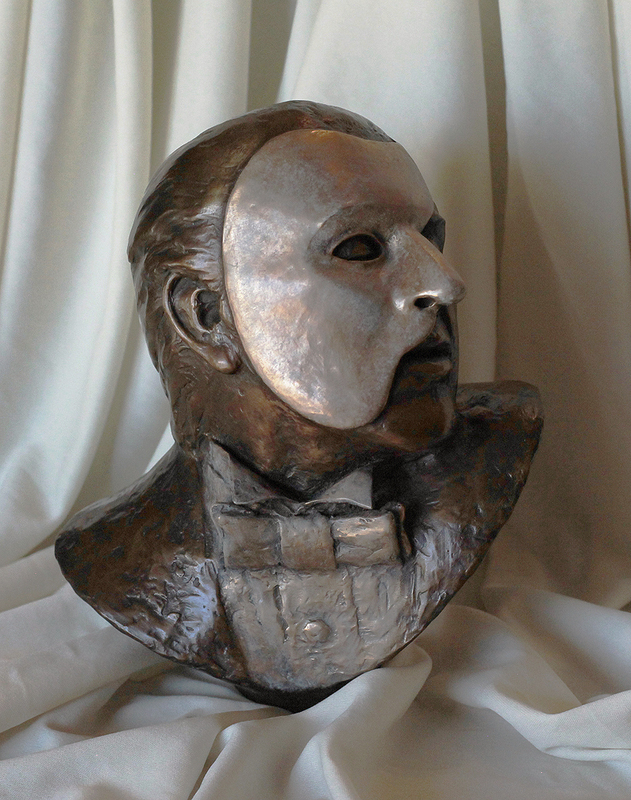 One of the first of many works of art in both paintings and sculptures portraying the Phantom of the Opera by artist Bradley J. Parrish. This original work titled “O.G. has remained as a part of the artists own collection since its competion back in 1995. This work is now available from the artist in our oline store here. “It is so nice to see all the love from around the world coming out to take in Les Miserable’s In Concert. I know they loved it when I experienced it in Paris (their first opening performance) before their national & worldwide tour, and had no doubt that the whole world would embrace this very talented group of performers on their multi year tour. Here are some photos I have grabbed from their Facebook page showing in the background and on t-shirts my painting of Cosette which I licensed to the group to lead their march around the globe. In front of Cosette are the performers and lines of people wanting the cast to sign their programs and souvenirs. Painted in 2007 / Image Size: 16" x 20"
*This original is now available to purchase from ArtBrokerage.com. For more information please click here. The first painting in the series of creation works by artist Bradley J. Parrish. 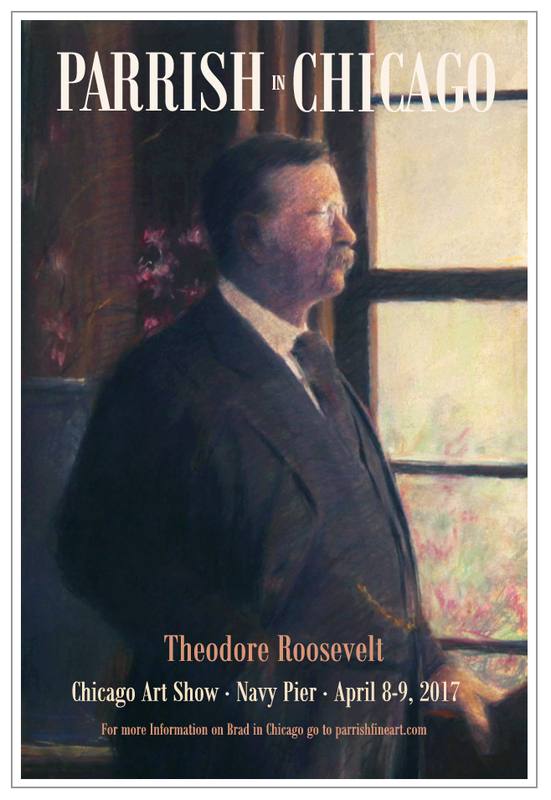 This $350.000.00 painting was sold to a major international art collector back in 2010 breaking a record amount paid by a collector for one of the artist Bradley J. Parrish's works. 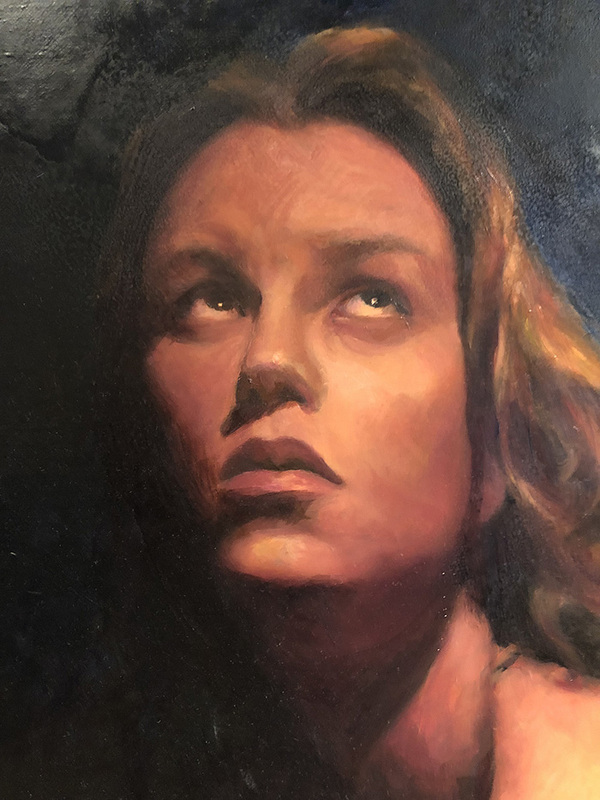 The Painting was also chosen by ARC the (Art Renewal Center) in New York for their annual "Solon" international art competition as one of the winning entries and featured in their international art competition catalog showcasing all of the winning entries. *For more information on this and other major award winning works by artist Bradley J. Parrish please go here. To see more of Bradley J. Parrish’s sculptures please click here. Artist Bradley J. Parrish was inspired to paint in oil on canvas his vision of little “Cosette” after reading Victor Hugo's masterpiece titled “Les Miserables” and as well from hearing the music and seeing Cameron Mackintosh’s musical production of the same back in the early 1990's. In 2016 the production company named CITIPROD located in France contacted Brad wanting to know if I would be willing to license his image of Cosette for their soon to be musical titled “Les Miserables en Concert”. Explaining to Brad that they were bringing home to all of France the music and the voices of its origin in this the “Les Miserable’s en Concert”. The concert will deliver to those all over France the musical performed in french for the first time in 25 years. Brad, after hearing the early material from this production was very excited that his work would be associated with such a quality production was on board and Brad’s little Cosette became the main image of this production. Brad recently received an invitation from producer Philippe Barreau wanting to fly Brad and his fiance to Paris on March 2nd to be their guests at this premiere musical event. Brad has graciously accepted the generous invite to attend the premiere at the Palais des Congrès in Paris which will run from March 3rd to the 5th. After the curtain closes on March 5th “Les Miserables en Concert” continues its national tour throughout France. We will be providing updates in the “News” section of our website as to Brad's trip to Paris as they become available. * For more information on CITYPROD and their upcoming production of Les Miserables en Concert as it becomes available you may go to www.lesmiserablesenconcert.com. To view Bradley J. Parrish's painting of Cosette, Click here. It was 46 years ago today that 500 signed and numbered limited prints were produced of this piece and released to the public. These prints are the only surviving images of the original painted by Artist Bradley J. Parrish in 1973 at the age of 15. It is the only image that has ever been reproduced of the original which was damaged and then stolen in the mid 1980's. It has never been seen again nor has it ever surfaced since. The Vatican in Rome has one of these reproductions from this edition in their archives to forever protect this image from ever being lost so that future generations can look upon this piece in awe at what this artist envisioned at the age of 15 when he painted it. *This Image is Available as a Fine Art Signed and Numbered Limited Print. Contact Us Here For Pricing and Availability. The most prestigious realist art competition in the Americas and perhaps the world has chosen my painting titled "Still Water" in the 12th International ARC Salon Competition as a finalist to be included in their soon to be published international catalog. This year they had 1,006 finalist works by 640 artists from 63 countries, representing 32% of works submitted. The thousands of artist's that enter this international competition bring forth great works of art that inspire us all. The best of the best are featured in this catalog. For additional information on this piece view the "Latest Works Gallery". Three of Brad’s paintings have been chosen from over 2500 entries worldwide to be featured in the 2014/2015 Art Renewal Center or “ARC” international Salon catalog. Several of Brad’s works have taken top honors on two separate other occasions over the years when he had entered this competition which also showcased his work in previous ARC Salons international competition catalogs as well, works such as “Passing Showers”, “Whispers of Love” and “Creation of Heaven & Earth” which sold for $200,000.00. The three recent Parrish paintings that were chosen by this year’s panel of judges to be showcased in this years catalog are shown above, (Left) is the “Creation of Heaven & Earth II”, in the (Center) is his painting titled "Creation" and to the (Right) is his Plein Air painting titled “Cedar in Silhouette”. These paintings can be viewed in the "Latest Works Gallery" and or in the "Available Originals Gallery".